WE WERE DRIVING to work yesterday morning and at Eighth and York, a guy on a micycle roared past, blowing through the three-way stop sign without a care in the world. Sheryl says he had to be going 30 mph downhill and didn't want to lose his momentum. The minivan heading east up York almost hit him. It would have been terrible, all the damage caused to the van. Potential SPLAT on the road. Yup. 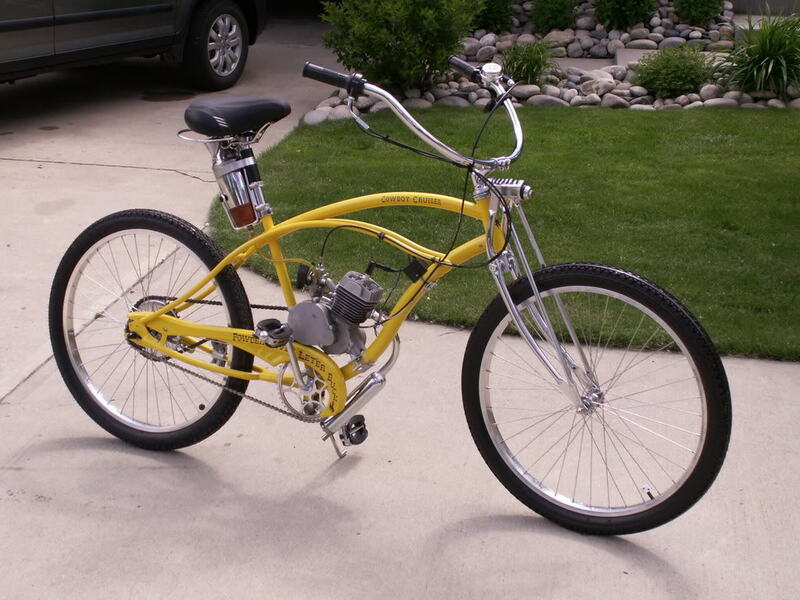 A micycle. They are bicycles with small 50cc motors. They are not illegal unless they go faster than 15 miles per hour. We see more and more of them, and apparently they are becoming the new way to have transportation when you lose your driver's license. They only require a license, insurance or vehicle registration when they go over 15 mph. There's a guy near Eighth and Washington who buzzes to the bar two blocks away and always goes faster than 15 mph. Micycles zip up Sixth Street all the time going very fast. And a couple of weeks ago I saw at least seven micycles and their owners huddled up around HyVee gas station pump, filling their tiny tanks all together. Great. Now we have Sons of Micycle Anarchy in Quincy. "You can run for two weeks on that tank of gas," one of the micycle owners said. Well. At least it's cheap. You can buy the kit here. They are all over the place. And they all go waaaaaayyyyy too fast. Back to our friend who blew through the three-way stop. If he keeps ignoring traffic signs, he's going to be splattered all over an intersection. And guess who gets to pay for it all, since I highly doubt Sons of Micycle Anarchy are in good hands with All State. I just hope the driver of the vehicle that hits him is OK. And I hope it isn't me or Sheryl.